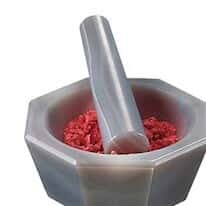 Mortars and pestles are ideal for preparing samples. Choose a mortar and pestle in materials compatible with your application. Agate is ideal for applications that require contamination-free results. Alumina provides precise elemental analysis where minimal sample contamination is required. Flint glass mortars offer clear view of materials. Porcelain mortars and pestles are available for general use.